We have been experiencing much warmer temperatures over the last several weeks. Soon enough, the sun will be scorching the Phoenix Valley, leaving your plants and trees THIRSTY! Water conservation in the Valley is somewhat of a challenge. After all, we live in the desert! Watering plants & trees longer and deeper versus more frequently is the best approach for ensuring they maintain their health throughout the Valley’s harsh summers. Applying the appropriate thickness of mulch to the top layer of soil around plants and trees will help keep it insulated from extreme temperatures (both hot and cold). It serves as a barrier between the sun’s harsh rays and the earth. As a result, mulch helps to conserve moisture, minimize weeds and moderate soil temperatures. 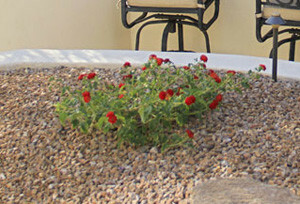 Most landscapes in Arizona use rock mulch. But after time and with regular landscape maintenance, the layer of rock tends thin out and become ineffective. You should always rid the area of weeds first and you may want to consider laying down a porous landscape cloth that will serve as a weed barrier. Using a porous material will allow water to penetrate into the soil below. Impermeable plastic is not recommended. Organic and inorganic mulches are available. Some examples are organic wood mulches and landscape rock (crushed rock / granite) but there is a wide selection of choices available at your local home improvement store or nursery. If the ground is very dry, be sure to water the plant deeply before applying the mulch. For trees, the layer of mulch should be about 1” deep and kept away from the trunk and root crown in order to prevent excess moisture that may invite unwelcome pests. You can top-dress planting beds with up to 2” of mulch. It will reduce weeds and evaporation, which translates into both money and time savings.